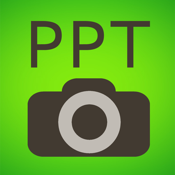 "PPT Shot" Built-in advanced image recognition engine, which automatically in the picture of the screen, whiteboard, books, posters and other graphic objects identified and corrected. Support Export PDF and share Weibo. Is your venue records, class notes is a good helper.